We got to the train station in Bangkok pretty early. Our train didn't leave until the evening, so we got lunch and spent a few hours hanging around and waiting. Once we got on the train, we found our room for the night. We had four beds in our room, Megan and I had two, and then a couple from China had the other two. They didn't speak a ton of English, but were friendly and of course wanted to take a picture with us the next morning before we arrived at Chiang Mai. We had dinner on the train and ordered two beers, which we thought would be regular sized...but surprise! They were huge beers. But it's not like we had much else to do, so we just spent the night chatting and drinking beer, which was A-okay with us. I didn't sleep too well that night, mostly because the air conditioning was FREEZING and all we had were super thin blankets. Our beds on the train. People come around and make all the beds a little while into the ride. We weren't exactly expecting to drink THAT much beer....but you don't have to twist our arms. There are curtains that go all the way around the beds so that you have privacy while you sleep. After our not-so-restful night's sleep, we finally made it to Chaing Mai and were instantly bombarded by a million taxi drivers who wanted to take us to our hotel. I'm pretty sure we were MASSIVELY ripped off, but at that point we were just ready to get to our next hotel and take a shower. And besides, being ripped off in Thailand still doesn't equate to much money in US dollars. Luckily, we didn't have to wait too long to check into our hotel. After showering and catching up with all of our interneting, we headed out to do some exploring in Chiang Mai. Our hotel in Chiang Mai was great....and so inexpensive! During our first afternoon we made it to a few temples. I had seen a number of temples in the distance throughout our traveling, but seeing them up close was naturally a much more powerful experience. I've seen a number of Buddhist temples in Korea already, but the temples in Thailand are quite different in a number of ways. The temples in Korea are beautifully and intricately painted, primarily with red and green colors. However, the temples in Thailand are full of orange colors and there is GOLD, shimmer, and shine at every turn. So much detail at every turn...it's amazing! Buddhist monks in the distance. We saw SO MANY Buddhas over the course of our trip! Temples. mountains, palm trees, and a setting sun. I love Chiang Mai! It was really interesting being in a country that's primary religion is Buddhism. While there are Buddhists in Korea, it's by no means the main religion. Driving around Thailand there are temples everywhere, just as there are churches everywhere in America. You also can frequently see the monks walking around town in their orange robes--at the train station in Bangkok we even saw a section of seats reserved for monks. It's obvious that Buddhism is a huge part of Thailand's identity, and if nothing else, the amazing detail in the temples shows just how important this religion is to this country's heritage. I can't even imagine how much time and money had to go into creating each temple. It's really astounding. After walking around quite a bit, we rewarded ourselves with some coffee, and eventually headed back for some dinner. 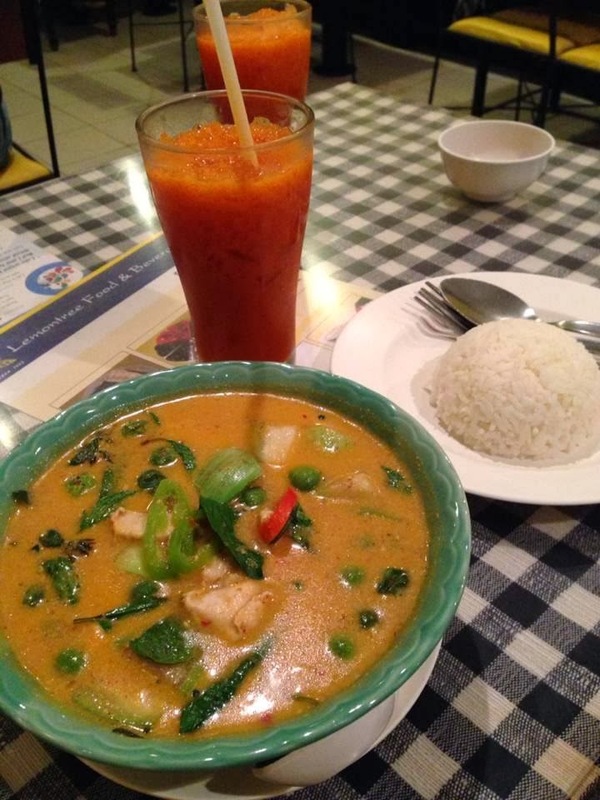 I had some delicious Thai iced tea and curry for dinner, all for the equivalent of a few dollars. The delicious dinner, which turned out to be a terrible mistake. We had an early night because the next morning we were scheduled to be picked up at 8:15 for a day at the elephant park. Of all of our plans for vacation, I was most excited for our day with the elephants. I had been eagerly awaiting that day since we scheduled it a few weeks prior, and at last the time had almost come. Everything was great....until I suddenly woke up in the middle of the night and knew something wasn't right. I was sick.